A harvest—up from 3 bags to 8 bags in the same plot, with 8 bags being equal to one ox cart full. One farmer said that now he gets 5 oxcarts for of corn from 5 kg of seed. Over 8 years the harvest on the same plot went from 100 kg, to 150, to 200, to 250, and last year reached 450 kg. 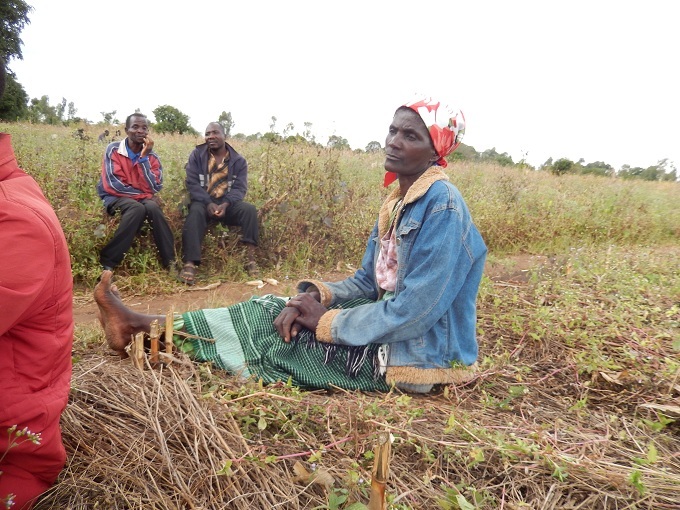 We heard about a conservation agriculture group of mostly women farmers growing from 20 members 3 years ago to 91 members now. And, usually their plots are not bigger than 75 feet by 75 feet. 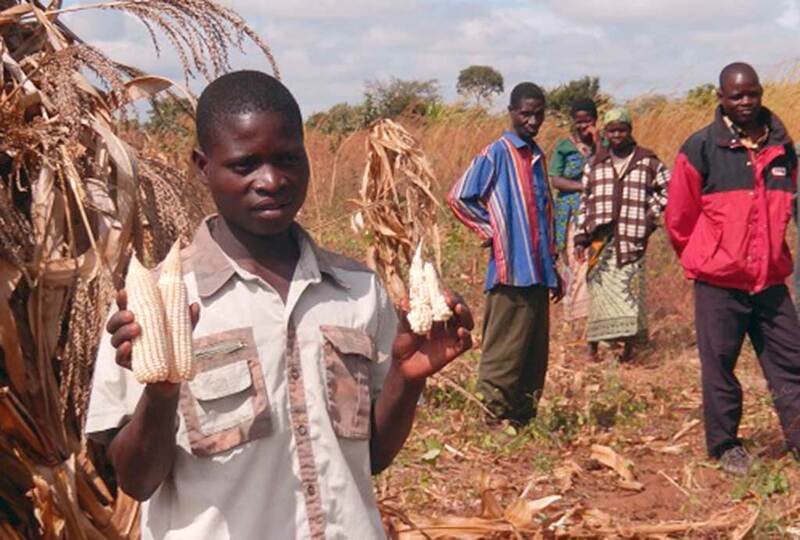 “Now I harvest four more months of food than we did before for my family of five. For me it was fun to tell Ana Maria and Fatima, two women farmers to be our teachers and teach us each step of their successful work. 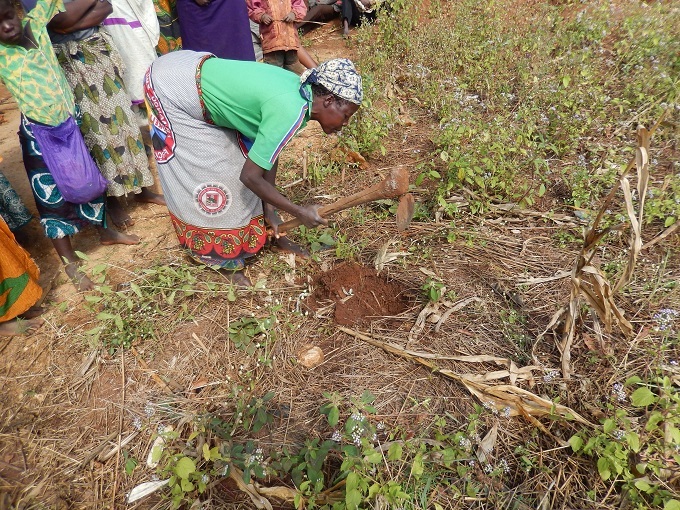 Ana Maria showed us how she digs the planting holes that she reuses each season, after she makes the compost to put in them at ½ to 1 kg per planting spot. And she showed us her compost pit. The pit is for dry season composting, to help keep the compost moist. 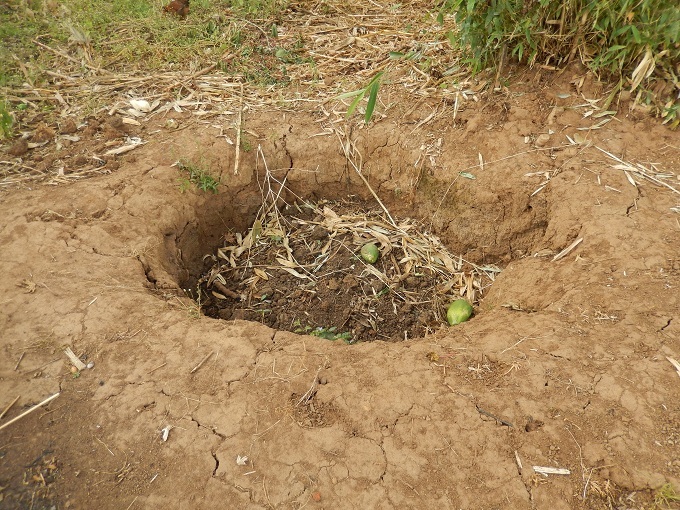 She fills it with 1/3 green material, 1/3 dry material, some manure, some soil —-and after chopping and adding water she fills the 1 m to 1.5 meter diameter and 1 meter deep pit—and then turns it every 4 to 5 days for the first month. A lot of work! Fatima walked us through every step. Clearly she is a great teacher! At the end of our time together we sat down in the shade at the edge of Fatima’s field. 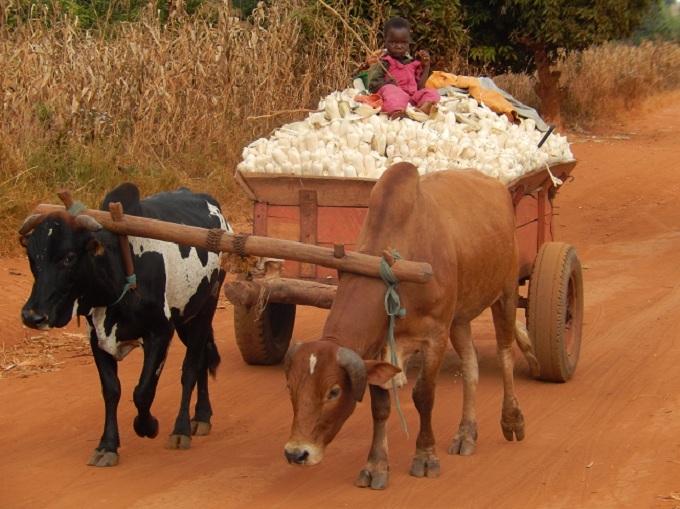 An Oxcart full of Corn with a Solitary Child Driver. No one could explain this! How can such a success story be improved upon? Well in the coming months we look forward to Roland Bunch the author of the book, Two Ears of Corn, coming to train the teachers of conservation agriculture in Malawi, Mozambique, and Zambia about how to weave nitrogen-fixing beans, peas, and bushes into their farming so that they can restore their soils, on a larger scale, with less onerous work. Meanwhile, the farmers themselves are thinking all the time, too! If you would like to see a neat little video that tells about this same group of people, please go to the World Renew web site.